Topsco are worktop specialists and one of the UK’s leading suppliers of stone within the kitchen development industry. They pride themselves on quality and set the standard in their industry for craftsmanship and produce. Topsco was founded many years ago but had yet to build an online presence to match their stellar offline reputation. They possessed a strong following on social media but wanted to attract much higher levels of traffic through Search Engine Optimisation and Pay Per Click. One of the biggest problems that Topsco faced was the fact that they had no organic traffic coming through search engines. Their social media presence was bringing in the majority of their users, but they weren't ranked for any of the most crucial keywords that their competitors were dominating. They were missing out on huge potential pools of customers because their ranking strategy just wasn't strong enough. They needed an agency that could get them more leads and quickly. The solution included a number of services. To bring in leads quickly and ensure that business was coming through the doors a Google AdWords campaign would be set up, this would start driving some traffic to the site whilst a link building and content marketing campaign would be started. Throughout the link building campaign, keyword research, outreach to bloggers and infographic placements would take place. With all of this, Topsco would see a rise in traffic and conversions online. A multi-channel digital strategy that would raise Topsco's online presence and get their site ranked for the most valuable keywords in the market. We set up a Google AdWords campaign that would start driving traffic to the site within a quick time frame. Simultaneously, we worked on a link building and content marketing campaign that would attract organic traffic. We conducted keyword research, fostered outreach to bloggers and created infographic content to grab attention and pull viewers to their site. Their existing following made it possible for our team at Bulldog to construct gripping infographics and achieve great levels of outreach. We implemented a content strategy that included split testing ad copy, trialling new keywords, cancelling out negative keywords and optimising long-tail keywords. 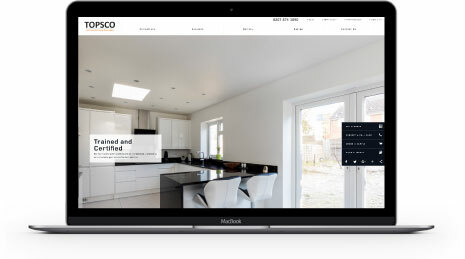 Throughout every stage of our work, we kept Topsco well informed of our progress and let them in on any changes we felt needed to be made for further results. This approach plays a large role in ensuring our clients stay up to speed with every step of our work.